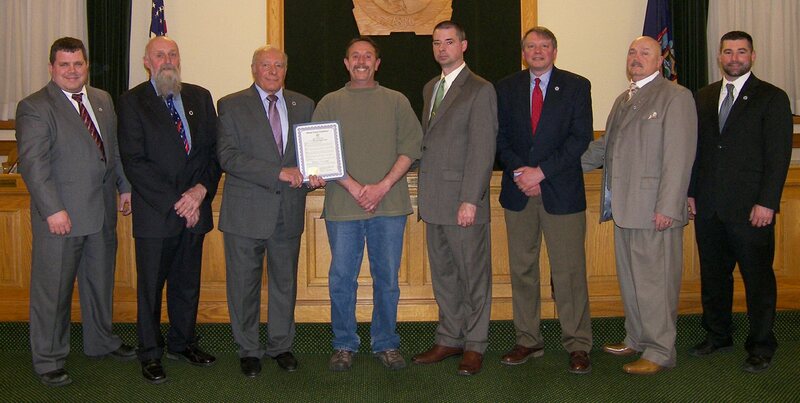 OSWEGO, NY – The Oswego County Legislature’s Economic Development and Planning Committee presented a certificate to Tim Carroll, chairman of the Oswego County Environmental Management Council, designating April 22 to 28 as Earth Week 2015. Oswego County has an abundance of scenic natural areas for its residents and visitors to enjoy. To mark the occasion and protect these precious land and water resources, residents can clear litter and trash along the roadside, plant trees and establish rain and habitat gardens. 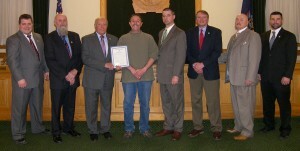 Pictured from left is Daniel T. Farfaglia, District 24; David M. Holst, District 4; Committee Chairman Morris Sorbello, District 23; Carroll; Committee Vice Chairman Shawn Doyle, District 3; Roy E. Reehil, District 5; Frank Castiglia Jr., District 25; and Jacob A. Mulcahey, District 15.